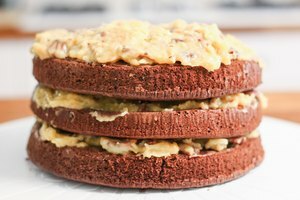 Can I Pour Chocolate Ganache Over Buttercream Icing? A cake without icing is like a salad without dressing or a hot dog without a bun. It's not bad, it's just not all it could be. The most common icings are buttercreams, made of butter and sugar by various methods. Another versatile icing is a chocolate mixture called ganache, which can be whipped to an icinglike texture or poured as a glaze. A glossy coating of ganache can even be poured over buttercream. Buttercream and ganache are both rich toppings, though they're made differently. The simplest form of buttercream consists of butter, powdered sugar and milk, beaten together to a soft consistency. Professionals use more sophisticated version, usually made by cooking the sugar to a syrup before combining it with butter and eggs. Ganache is an entirely different coating. It's made by pouring hot cream over chopped or grated chocolate, and stirring until the chocolate has melted. 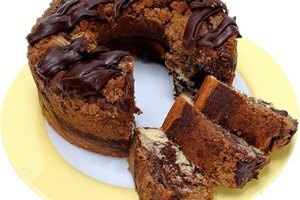 When warm, the ganache can be poured over cakes and pastries to make a lustrous glaze. When cooled, it can be whipped to a consistency resembling buttercream, and spread on cakes or used as a filling. 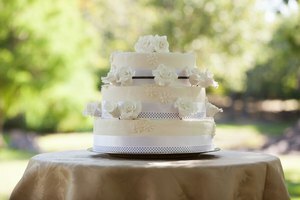 If you want to cover a cake with both buttercream and ganache, either for a two-tone effect or simply for the sake of the shiny glaze, start by filling and assembling your cake. Then, spread the surfaces of the cake with a thin coating of buttercream, as if you were spreading butter on toast. This is called a "crumb coat," which immobilizes crumbs on the surface of your cake and prevents them getting into your icing. Refrigerate the cake for 20 to 30 minutes, while the coat sets, then spread the top and sides of your cake evenly with buttercream. Make it as smooth and even as possible, because the glossy ganache will emphasize every imperfection. Some bakers want their ganache to make a smooth layer on top of the cake, with an eye-pleasing pattern of drips running over the side. 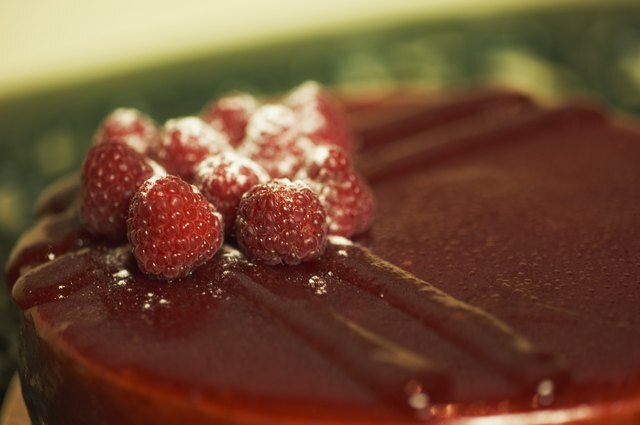 To achieve this effect, refrigerate your cake for at least an hour before pouring the ganache. Mix up your ganache and let it cool to a temperature of 85 to 95 degrees Fahrenheit, which give it a thick, creamy consistency. Pour ganache onto the middle of the cake, and quickly spread it to the edges with a spatula. Turn the cake as you work, so the drips will run evenly down all sides. Allow the ganache to set for at least 30 minutes before cutting and serving the cake. Warm ganache has a tendency to slide off the buttercream in sheets, so if your goal is a cake that's uniformly glazed with ganache over its entire surface it's best to pour twice. Make up a double batch of ganache, and refrigerate your cake for at least one hour. Cool the ganache to 100 F, which will leave it relatively thin and runny. Pour the ganache at the middle of the cake and spread it with the spatula, then run the spatula around the cake's sides to spread the ganache evenly. There will be a few thin or bare spots, but this is normal. Refrigerate the cake for another 30 minutes. Gently warm and stir the ganache until it reaches 85 to 90 F, then pour a second layer with this slightly thicker ganache. 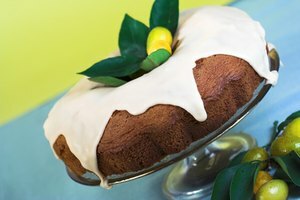 Before glazing your cake, most instructions say to place it on a wire rack over a parchment-lined baking sheet. That way, the excess can be recovered, strained for crumbs and reused. Unfortunately lifting the cake from the rack, and cleaning the rack afterward can be difficult. 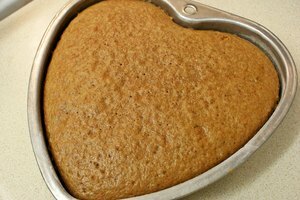 A simpler method is to rest the cake on a smaller cake pan or ramekin. The ganache will still run freely to the sheet, but it's easier to lift the cake off and there's no wire rack to clean.